Low-grade Ta tumours recur at a rate of 50% to 70% remaining superficial, but approximately 5% of cases progress to muscle invasive stage . However it is extremely uncommon for low-grade Ta to metastasize without evidence of local invasion. A 58 year-old man was diagnosed with bladder cancer. Thus, he was treated with TUR and a simple mitomycin-C instillation. Pathology result was transitional cell carcinoma Ta low grade. Until 2009, six relapses occurred, all of them was treated by the same way and they had the same pathology result. In February 2014, a lung nodule was founded in a routine chest x-ray. The pathology result was two centimetres M1 lesion of transitional cell carcinoma localized in medium lobe. In October 2014, the patient related ptosis and diplopia with evening deterioration so he was diagnosed with Myasthenia Gravis paraneoplastic syndrome diagnosis. Since 2014 until now, both bladder cancer and Myasthenia Gravis are controlled, without evidence of progression of the disease. Risk of metastasis in non-muscle invasive bladder cancer is very low. The most frequent site of metastasis are lungs. In this way, there are 11 case of non- muscle invasive bladder cancer in the English literature. To understand how a non-muscle invasive bladder cancer can metastasize we refer to anatomy principles. Some of the hypothesis have been postulated are based on iatrogenic, like intravascular dissemination of tumour cells during TUR or degeneration of the basal membrane caused by intravesicular therapy. On the other hand, is well known that sometimes understated tumour mistakes are committed. Paraneoplastic syndromes are defined as a collection of symptoms and clinical signs develop in cancer patients and they occur in organs or systems non- related with the primary tumour. Additionally, paraneoplastic syndromes may be produced by biologically active substances like hormones, autoimmunity, immune suppression or any other immune disease occurred in neoplastic context or unexplained causes. The case presented shows an uncommon entity. Despite the origin of these metastasis is not clear, is well known that are possible to occurred, being lung metastasis the most common. 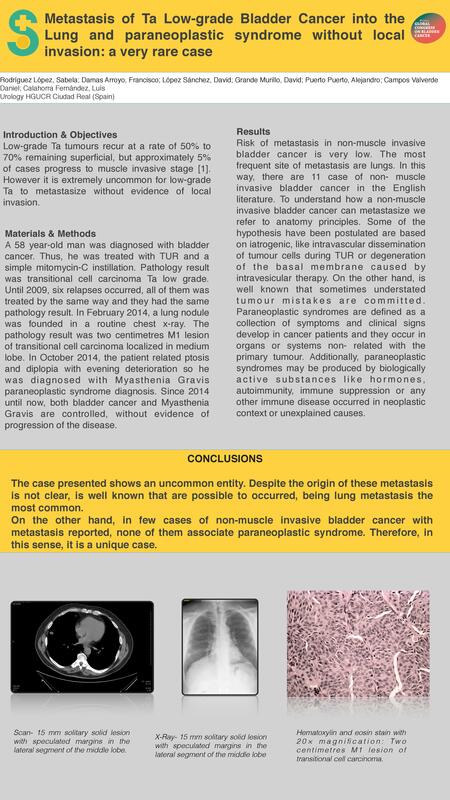 On the other hand, in few cases of non-muscle invasive bladder cancer with metastasis reported, none of them associate paraneoplastic syndrome. Therefore, in this sense, it is a unique case.